Aircraft Brake Piston - Chardon, Ohio-Chardon Metal Products Co.
At Chardon Metal Products Co., we have a strong reputation as problem-solvers, which led a company in the aerospace industry to approach us about manufacturing the aircraft brake piston highlighted here. Due to quality and delivery issues with their previous supplier, they were looking for a new, ISO certified machining company that could accomplish the accuracy and precision needed for this critical component. Since the brake system of an aircraft is under massive strain during the braking process, the pistons had to meet very high-quality requirements. The part geometry included several difficult features, including thin walled sections and complicated profiles inside the bores. Our manufacturing engineers determined that we could effectively machine this part from a single setup using our 4-axis turning center equipped with live tooling. This allowed us to achieve improved productivity with a high degree of process control. The material of construction was 17-4 hardened stainless steel, which possesses a valuable combination of high strength, hardness, and corrosion resistance. We engineered an intelligent combination of cutting tools and operating parameters to machine the workpiece at exceptionally efficient material removal rates. Special holding jaws allowed us to protect the parts OD surface and maintain a 32 RA finish. Quality assurance involved 100% attribute inspection to ensure the parts were machined with repeatable accuracy. 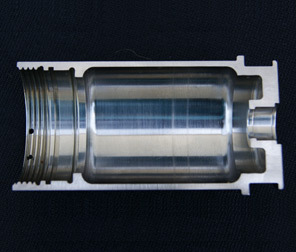 Once completed, the parts measured 3.0" x 1.5" in size. The reliability and stability of our process allowed us to uphold very close ±.0005" tolerances. Additional operations involved passivation to provide a uniform, smooth finish with improved corrosion resistance. By engineering a productive and stable manufacturing method, we solved the customer's quality and delivery issues. 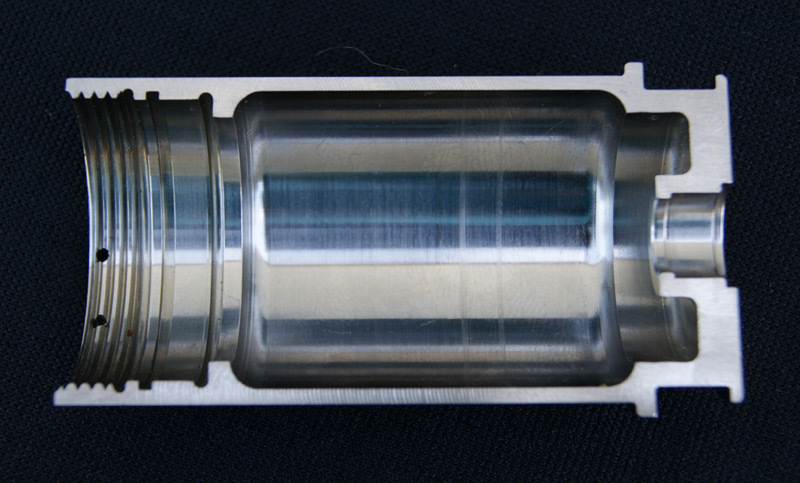 At peak production we manufactured these brake pistons at the rate of 2500 part per year. If you are interested in learning more about this project or our machining capabilities for the aerospace or any other challenging industry, contact us today. Ability to machine harden stainless steel. Challenges included thin wall, bottle boring, and a trepan feature.